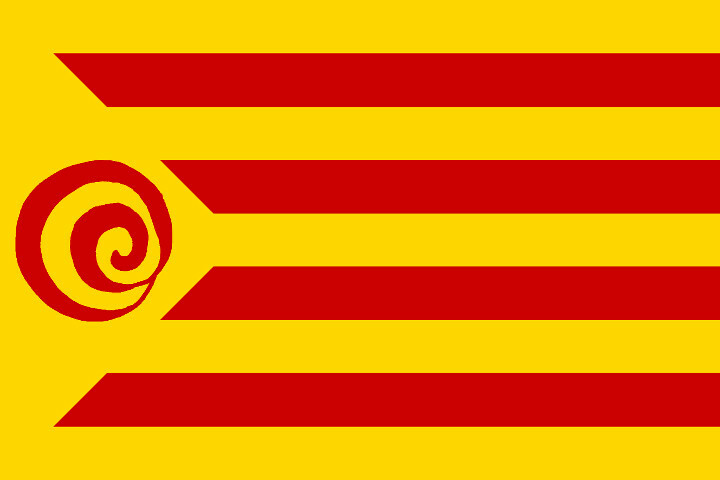 The “estelada decrecentista”, or the Catalan flag with the degrowth symbol instead of the usual star, from “Casdeiro” – click for original context. Update: 19 December, 2017. Further to the article below, a lot has happened in Catalonia. The parliament has been suspended by Madrid’s Popular Party minority government. Oriol Junqueras, criticised for his conventional economics below, is in prison with another independista politician. The (centre right) Catalan president Carles Puigdemont is in exile in Belgium. Elections take place on Thursday, 21st and the CUP, Sergi Saladié’s party is campaigning on a broadly post-growth and anticapitalist manifesto. Some of the key points are available in a one page English translation together with a longer machine translation from Catalan to Spanish of the section “For an Ecological Republic that breaks with the logic of capitalist growth and guarantees the environmental future of the popular classes” at the file linked here. By sharing this we do not necessarily endorse the position of the CUP with regard to independence. The arguments of Podemos and its allies on this matter should also be considered. But we do welcome the CUP’s distinctive and clear message on the need for alternatives to the pursuit of GDP growth. The article by Antonio Turiel, posted in October, follows. We recently carried a translation of an interview with Sergi Saladié who introduced a debate on degrowth into the Catalan parliament. Catalonia is very much in the news at the moment with the referendum held by the governing coalition and the violent repression by the Spanish State. We do not have a view on this matter, noting that independence has not had a majority following in Catalonia but that the disproportionate actions of the Spanish government could well change this. We believe in the principle of subsidiarity, that decisions should be taken as locally as is feasible – some very local, some on a supra-national level. The question of separation is one for all the population of Catalonia. But whatever the degree of autonomy that eventually emerges, the question of the limits to growth, together with that of material resource flows in and out of the territory, cannot be escaped. The initiative of Sergi Saladié is therefore relevant to our own situation in a city (or better, bio-) region, and so is the reception that it received. In the following piece, Antonio Tureil analyses the debate, with particular focus on the arguments put forward by the more conventional socialist from the ERC, Oriol Junqueras. In our own parliament we have an initiative in the form of the All Party Group on Limits to Growth, but to my knowledge the MPs listed as members have not themselves adopted an explicit degrowth stance. More widely, gross misconceptions are routinely voiced, not dissimilar from those that Antionio Turiel takes apart. During the last week, Spain has lived through an institutional crisis without precedent. What many thought would never happen finally did. I won’t dwell on the details: readers in Spain probably know them only too well, and for those that live elsewhere it should be enough to say that the independence-supporting parliamentary majority in the Catalan parliament has passed laws to convene a referendum on 1st October and for the eventual creation of a Catalan Republic. Of course these laws set themselves up as above those of Spain, something that the Spanish institutions obviously cannot accept, and so the institutional crisis is intense at this moment. At the edge of this new chapter in the journey of Catalan sovereignty (which will obviously not lead to the proclamation of the Catalan Republic at this time, although it will obviously increase the pressure for independence for the future), in the midst of this storm, something surprising and significant has happened: on behalf of the Popular Unity List (CUP: la Candidatura d’Unitat Popular – a movement that describes itself as anticapitalist and for independence, that supports the governing majority in Catalonia) the MP Sergi Saladié (a university professor when not in parliament) presented an “interpelation1” on degrowth to the vice-president and minister for the economy in Catalonia, Sr. Oriol Junqueras, currently president of The Republican Left of Catalonia (ERC: Esquerra Republicana de Catalunya). It is the first time that a motion of this type has been discussed in a national parliament in Spain, and this makes it an event of great importance. The presentation of this interpelation led to an interview with Sergi Saladié published by Manuel Casal in 15/15\152 ….. The interview is already quite eloquent about the dissensions and divergences within the CUP, which makes it clear that the promotion of this interpelation comes more from the effort of Sergi and several people who support him than from [degrowth being] a majority sentiment in the CUP. For all that, it marks a big and important precedent, as does the response from Oriol Junqueras. It is worth remembering that the ERC is a party that knows about Peak Oil and the Limits to Growth3: its previous president, Joan Puigcercós, spoke openly on these themes on several occasions, and notably in a [Catalan] television programme. In this parliament, the ERC spokesperson, Marta Rovira, made explicit mention of Peak Oil during the debate over the failed investiture of Artur Mas. This makes it especially opportune to analyse the discussion that took place between Sergi Saladié and Oriol Junqueras as a result of this interpelation. I will provide a summary of the debate before analysing its most outstanding aspects. Sergi Saladié contextualises the interpelation4 in the constitutional process for the new republic, explaining that degrowth is understood as an ordered process of reduction in activity and consumption, and that on several indicators we are already in a process of degrowth, though not a planned one. He mentions that resources are limited and that the capacity for absorption of waste products is also limited, while capitalism feeds the myth of infinite growth. He explains that the ecological footprint of Catalonia is 6.7 times that of its territorial area and that it therefore has to appropriate resources from other countries. Later on he recalls that the International Energy Agency recognised Peak Oil (for conventional oil) in 20105, and that since then many false solutions to the problem have been proposed, introducing new liquid hydrocarbons of low quality and at high cost, which have led to the ruin of many businesses, and that at the present time, petroleum companies are dis-investing ferociously6. And moreover, the same thing is happening with coal, uranium and gas. He adds that some economists (e.g. James Hamilton7) have been warning for some time that these peaks will bring about an indefinite economic crisis. He finishes asking for reflection in order to confront these realities. Oriol Junqueras begins his speech with thanks for the opportunity to speak on these themes (as if someone had prevented this happening up until now). He then discusses whether the issue is degrowth in general or just economic degrowth, and says that with respect to the use of natural resources he is very much in agreement with Saladié (leaving implicit that with regard to the economic part they do not agree), emphasising that the solution lies in the improvement of efficiency and better deployment of resources in order to reduce their use. After this he talks about the meaning of economic degrowth and says that about this they are not so much in agreement, since growth is important to create jobs and to fiscally sustain the Welfare State, and that is why economic growth is a key objective. He then goes over the current good economic indicators for Catalonia (as is that demonstrates something with respect to what is under discussion). The ecological footprint then gets lost in a historical review of the population that Catalonia has supported, leading to the Catalan economy being an open one, thereby misinterpreting the term by focusing on the amount of agricultural land needed. According to Junqueras, technological development has made it possible to gain access to resources that would otherwise be considered exhausted, and as a result, the point in time at which Peak Oil is reached is somewhat unclear as it depends on technology and on prices, and the rivalry between various forms of production makes the problem still more unclear, none of which is to negate the seriousness of the problem of sustainability. He then goes on to discuss the increases in productivity of the Catalan economy, better than that of other countries in the area, although that does not negate the importance of decreasing the use of resources, although here again he puts his faith in technological improvement. He finishes with a brief discussion of the evolution of the concept of property in the context of capitalism and its historical evolution, which he promises to develop in his final response. Saladié recalls the Limits to Growth report10 and how it anticipates a collapse in the middle of the twenty first century on present paths. He notes the collapse of 26 civilizations before our own, citing the book “Collapse” by Jared Diamond11. As he explains, in the five cases that Diamond discusses, the collapse is usually the result of a combination of environmental degradation and scarcity of resources, and unlike what has happened previously in history, now we are about to face a collapse on the global scale, which means it will be important to increase territorial resilience. Precisely because of that, there would need to be radical changes, in energy, settlement patterns, food, and even more importantly, in social values. Moreover, this change is urgent and would be comparable with the establishment of a war economy, given that we are, in effect, in a state of war against our own extinction. He justifies taking the opportunity to introduce this debate now, given the exciting moment of construction of a new republic, saying that that this therefore is the best occasion to raise the question of degrowth, given that it is very important and not merely an eccentricity. Finally he asks if the government considers or has considered measures to improve food and energy sovereignty. Junqueras replies, he says, from the perspective of the Department of Economy and Finance and affirms that the higher the productivity of production, the higher its sustainability, and that the key is technology. He reminds us that Catalonia has resources that are subject to limits (emphasising the case of water but acknowledging that there are others) and that it is necessary to take action. He accepts that there have been complete civilizational collapses (he says in “economic systems”), but puts the emphasis on the environmental dimension, only discussing climate change. He emphasises supporting the production of products with high added value, which he asserts, offer greater resilience and he reminds us that Catalonia has approved a climate change law. But he also reminds us that the problem of climate change is not confined within the borders of Catalonia. He concludes by affirming that he awaits the proposals in the motion that will follow this interpelation, with specific measures in the areas of energy, food, water, etc. that will certainly be incorporated legislatively. Sergi Saladié’s contribution is very well focused and gives quite a lot of facts, despite the short amount of time available to discuss something of such importance. The contextualisation is absolutely correct, and perhaps the only thing he might have overlooked, if I had one criticism, would be to have focused more specifically on the negative consequences that the typical business as usual responses and false solutions proposed by Junqueras would have for Catalonia. I will spend a lot more time analysing Oriol Junqueras’s replies, of course, for two reasons: firstly, because he is representing the Government, particularly with his economy portfolio, and secondly, because Oriol Junqueras is an intelligent, well educated person who is part of a left-wing party which is, moreover, very aware of the problems referred to above. So, it is really important to understand the arguments which Junqueras is using in order to, basically, carry on without doing anything. To sum up, I would like to understand what he is mentally relying on in order to take the weight off his conscience and not fall into the logical consequences of that which we are talking about. And I would like to identify those justifications in order to be able to destroy them and make it more difficult for him to evade his responsibilities next time around. Junqueras’s initial argument is a logical error of grand proportions. Affirming that economic growth is necessary to create employment and the financial sustainability of the Welfare State is a tautology, once one adds on the necessary tag of “in the context of our liberal capitalist democracies”. Without even questioning whether this might be the best or only type of social organization, Junqueras’s argument is totally pointless: what Saladié is proposing is that it would be physically impossible for growth to continue, irrespective of whether we like it or not, or if it suits us or not. In this context, to say that we need growth if we want to have employment, a welfare state and, in general, a peaceful society, is to recognise that not facing up to the physical impossibility of more and more growth implies that we ought to make changes to our social organization because otherwise we will end up with enormous levels of unemployment, the welfare state would collapse and, to sum up, we would descend into open social conflict. Naturally, Junqueras is perfectly aware of this non sequitur (even though growth might be necessary for him does not imply that he could ensure that growth would occur) and he therefore returns to his main argument, that which recurs throughout his reasoning: techno-optimism (it might be better to call it “techno-faith”) in its variant forms. Before going into the discussion over the various techno-optimistic arguments which Junqueras uses, it would be helpful to make a general observation. Faced with a problem as serious as one being argued at the present (seriousness accepted and recognized by Sr. Junqueras in this case), the core of his response is that we cannot discount the possibility that technical progress will improve the situation. In other words, we have a complicated situation but with a spot of good luck technology will resolve everything. Sr. Junqueras should be advised that such an attitude is completely irresponsible and unacceptable within public affairs, because if the miracle materialises all well and good, but if not we are all headed for disaster. For this reason, it would be much more prudent and acceptable, from the point of view of the responsibility of the administration, to be much more conservative, depend on that which you actually have available and adapt policies and strategies to those things; and if in time extraordinary advances take place then policies could be relaxed accordingly at that point. To sum up, it is a version of the precautionary principle, much invoked, yet much ignored, in talking about climate change. It is not surprising, as in the case of climate change, that applying the precautionary principle is eluded so as to not put at risk Business as Usual, given that what really matters to responsible politicians is economic growth for economic growth’s sake, despite it being moribund, if not definitely dead. The first reference to technology which Junqueras makes is related to the improvement in efficiency of production processes and is a fairly obvious eulogy to the dematerialization of the economy. Junqueras seems to believe that one can reduce the material and energetic base of the economy, at the same time as its GDP rises. Such a supposition is a fallacy discredited as much by history as by econometric analyses: 70% of GDP growth corresponds to the use of energy, and those much vaunted examples of improved energetic intensity show precisely the opposite of what they set out to demonstrate: the fact is that the economy does not dematerialize in absolute terms12 (perhaps it would be a good idea for Junqueras to read the minutes from the ”Meeting between the exponential economist and the physicist”13). In any case, it would be useful for Sr. Junqueras to revise the conceptual and theoretical bases which he has based his arguments on, as he is foolishly regurgitating enormous fallacies which are completely discredited by the actual facts. In the same way, Junqueras appears to believe, without being able to say exactly what he is referring to, that technology opens up access to new resources which were previously scorned. The only large scale example of this supposed change in recent years is the oil fracking exploitation in the U.S.A., a business which, as Saladié told him in his first speech, is ruining many companies and whose viability is impossible, and not because of the question of prices. It looks as if Junqueras has accepted the simplistic and infantile argument of so many inattentive experts and does not understand that the dynamics of price in a situation of scarcity, like the present, is that of high volatility and the destructive cycles of supply and demand known as “the spiral”. It is pathetically sad that Junqueras views the question of peak oil as a question of prices, and that those prices actually correspond with the dynamics of rivalry, accepting the repeated explanations by the Spanish financial press that it is all about a price war between OPEC and the U.S.A., with fracking as the spearhead. It would be extremely helpful if Sr. Junqueras would extend the range of his reading and pay attention to what Sergi Saladié told him in his first speech, where he says that the enormous fall in investment, collectively, by the world oil companies, in order to avoid bankruptcy, is causing a dramatic fall in investment in new reserves which condemns us to suffer a new peak in oil prices, probably before the end of 2018, as HSBC bank warned in December 2016, as did the International Energy Agency itself in March of the same year, although this was already indicated in its Annual Report for 2016 (substantial and authoritative references that Sr Junqueras and his advisors really ought to read). On the other hand, Sr. Junqueras believes that if the Catalan economy is centred around sectors of greater added added value, it naturally becomes more resilient, when what happens is actually the opposite: the products of higher added value are those of higher technological complexity, while the services of higher added value are those of the quaternary sector (services to services, and notably, for its added high value, those of the financial sector). Both sectors are extremely vulnerable to the problems of scarcity of resources: the technological, because they depend on scarce materials which require a large quantity of energy in their production; and the services sector, because its strength is conditioned by the availability of the income of the middle classes (the most obvious case is that of tourism, the main economic sector in Catalonia) and this is being compromised by the unstoppable internal devaluation which is causing the scarcity of resources and the fall of wide sections of the population in The Great Exclusion. In fact, this focus of the Catalan economy makes it more fragile, which is the opposite of being more resilient, but as Sr. Junqueras is dazzled by the current good evolution of the Catalan economy, he is unable to see the wall in front of him. The endless praise of technological advances and greater efficiency in the use of resources ignores, repeatedly, the Jevons paradox as well as the fact that technology is not energy, and implies that Sr Junqueras has an impoverished understanding of what has driven previous industrial revolutions. To bring the subject to a close, it is worth commenting that the subject of climate change is also given an excessively light treatment by the Generalitat Government’s vice-president. Given the urgency and serious nature of this challenge, the dilution of actual responsibility which he is so proud of, is really not acceptable when he says that it is a problem which falls outside the concerns of Catalonia (if every country were to say the same nobody would do anything). On the other hand, climate change is only one of the many environmental problems which we have to face; there are many more, generally of an entirely localized nature, many of which are occurring in Catalonia, which require action but about which nothing is being done at all. Sr. Junqueras’s responses to the questions posed by Sr. Saladié have been really poor and are not commensurate with the education and experience of such a person. If the vice-president really believes in the arguments he has set out, it is his duty to be better informed, in particular about what is happening to energy on a world scale and he should be capable of reading other texts which are not the unfounded banalities published here by the local press. And if he actually comes to realize that the situation is not like that, he should take on board the fact that there is no time for making compromises in order to look good to the economic powers; we are right now in the age of consequences and every month, every week and every day which we fritter away brings us closer to a change of disastrous consequences, and the responsibility for what might happen could fall on him in particular, given that he understood and knew what was being discussed. If, next year, we enter into a new surge of global recession and if Catalonia faces it under worse conditions than it might have had, then he will be mostly to blame. However the debate about de-growth, so crucial at this moment in time, has been completely overlooked in the midst of this informative whirlwind which has been occasioned by the tense and chaotic approval of the Catalan laws about its referendum and separation. So as we were saying, daily conflicts prevent us from seeing and understanding the processes we are following , to the point where we are incapable of recognizing collapse. 1 Process of submitting formal questions to the Government resulting in a debate. 11 Diamond, J. M. (2006). Collapse : how societies choose to fail or survive. London: Penguin Books. 12 Only in relative terms: the rate of growth of material use slows as the economy grows but the absolute level of material use continues to increase. This entry was posted in degrowth, economics, international, news and tagged Catalonia, CUP, degrowth, economic growth, economy, energy, peak oil, policy, Spain. Bookmark the permalink. 4 Responses to What happened when Degrowth was discussed in the Catalan Parliament? Strange, that you put forward the ruling elites and mass media’s view concerning Catalonias’ independence movement? Look at our actual words, which are in the past tense. It’s actually hard to know what the breakdown would be in an unconstrained referendum. Opinion polls commissioned by the Catalan government have given a narrow majority against independence, although a majority wanted either independence or more autonomy (e.g. within a federal system). The independence parties have a small majority in the present parliament. But the point of the article not about this question at all, which is why we have been explicitly non-committal on the question. Our interest is in the arguments for and against degrowth, and the extent to which politicians actually understand the profound consequences of living on of a finite planet with finite resources and finite sinks: a far more fundamental issue.